Take Interstate 80 to exit 93 or exit 90. From exit 93, follow Illinois Route 71 southwest to Illinois Route 23 and you will enter Downtown Ottawa. Take Interstate 80 east to Exit 90. 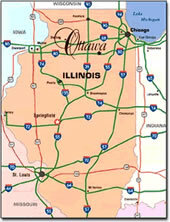 Follow Illinois Route 23 south and you will enter Downtown Ottawa. Take I-39 North toward I-55 South. Take exit #59A onto I-80 East toward Chicago. Take exit #90/IL-23 onto Columbus Street, follow IL-23 south toward Downtown Ottawa. Follow US-30 WEST, take ramp onto I-57 NORTH toward Chicago. Take exit #345B onto I-80 West toward Iowa. Take exit #90/IL-23 onto Columbus Street, follow IL-23 south toward Downtown Ottawa. Exit the park onto Illinois Route 71. Follow Route 71 east to Illinois Route 23 in Ottawa. Turn north, cross the Illinois River Bridge into downtown.